Is anyone else experiencing cabin fever? It’s been a long, dark, cold winter and it’s time to start planning for a warm getaway! 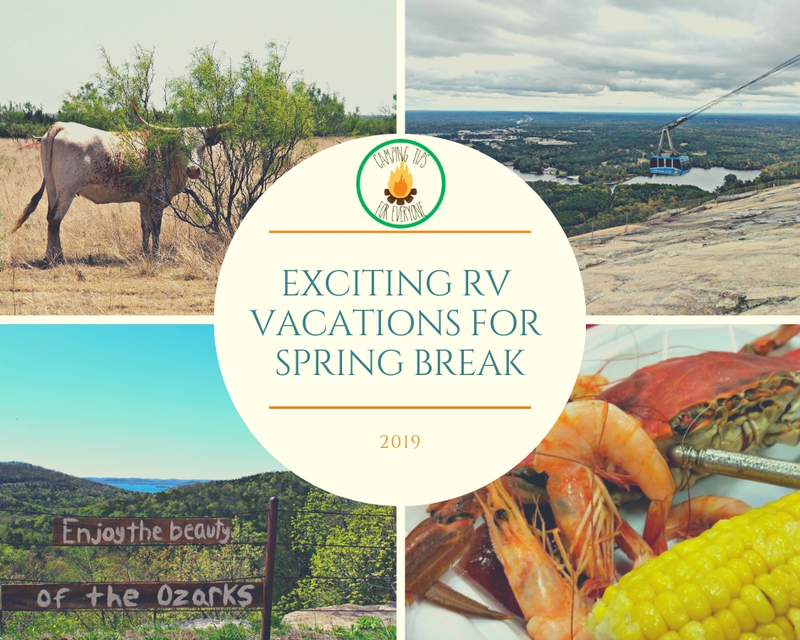 If you’re ready to pack up the camper and head someplace where the sun shines and layers aren’t required (unless we’re talking sunscreen), have a look at these spring break RV trips. It’s so easy to save or share this article! This year spring begins on Wednesday, March 20. Easter falls almost a month later, on Sunday, April 21. And National Park Week is April 20- 28, with entrance fees waived on Saturday, April 20. 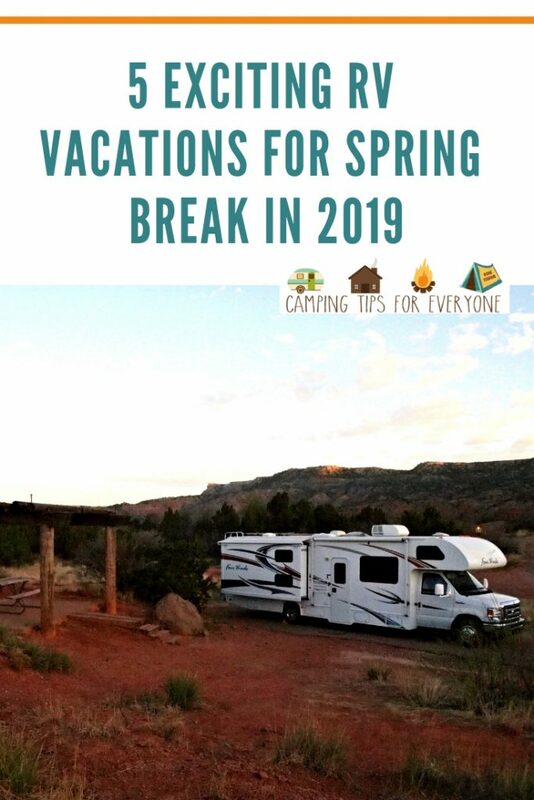 Because spring break travel can be busy, and expensive, planning spring break RV trips is a perfect solution to keep costs down and bring the family together! Don’t Own an RV? 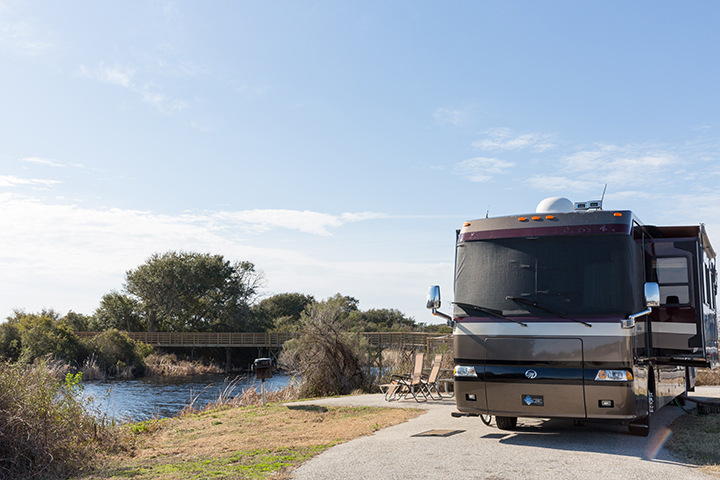 Check out our RV Rental 101 article! Located near one of the most vibrant cities in the US, but far enough away to feel like you’re in the middle of the country, DeKalb County is Atlanta’s best kept secret. A perfect location for outdoor enthusiasts as well as those who enjoy a little luxury, you’ll find plenty in DeKalb County to keep you busy! Hikers will love climbing the three area monadnock- Stone, Arabia, and Panola Mountains. If you happen to visit on March 30 you can even take part in Monadnock Madness, a one-day triple hike challenge! 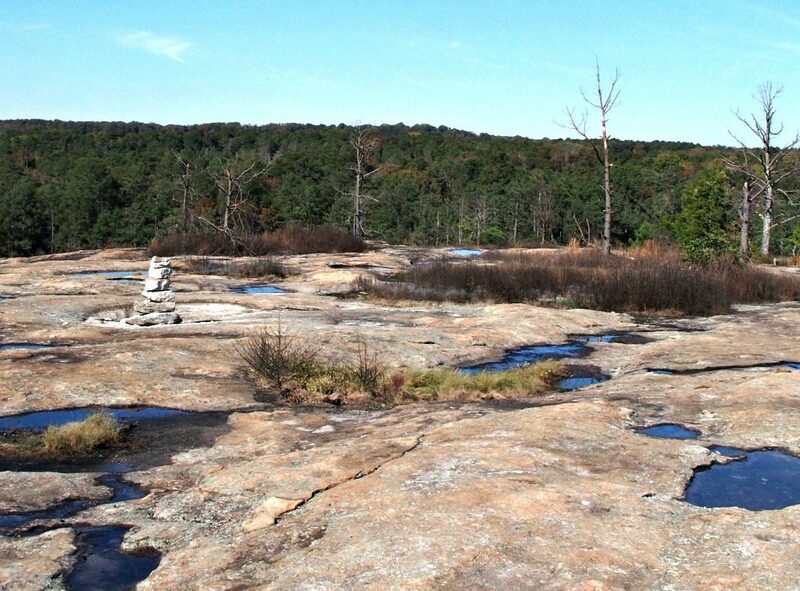 Arabia Mountain isn’t the largest monadnock in DeKalb County, but you won’t find the crowds here that you find at Stone Mountain. When you’re ready to step in from the great outdoors you’ll find plenty of diverse neighborhoods filled with boutique shops, artisan galleries, and and art centers just waiting to be discovered. For those nights you don’t want to cook, DeKalb County offers amazing eateries, from elegant dining to food trucks. Tip: for a meal you won’t soon forget make reservations at Arnett’s Chop Shop in Brookhaven. The steaks will melt in your mouth. And be sure to save room for the incredible Baked Alaska. Save room for dessert! 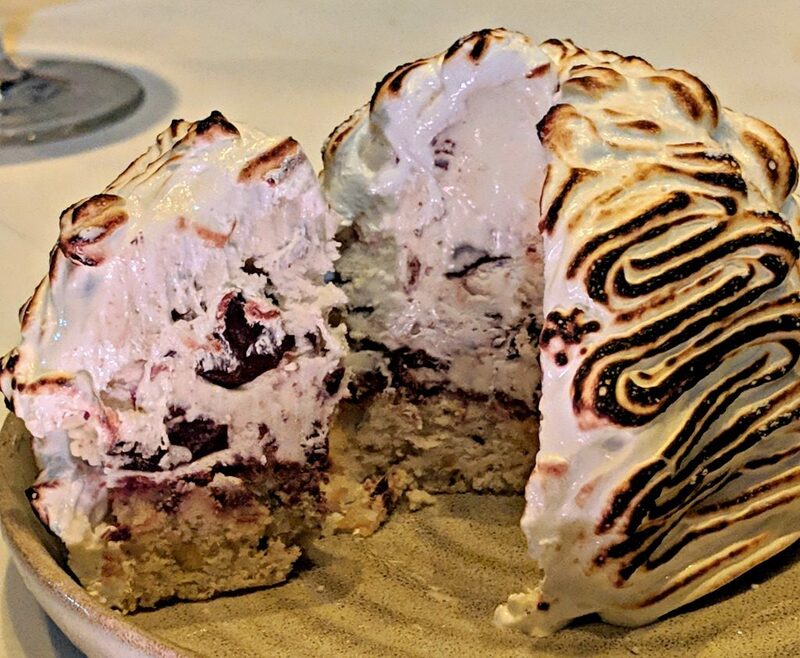 The Baked Alaska at Arnett’s Chop Shop is divine! Average temperatures in March and April range from lows in the mid 40s to highs in the mid 70s. Spring can be rainy, so pack accordingly (and be sure to use our tips for camping in the rain). 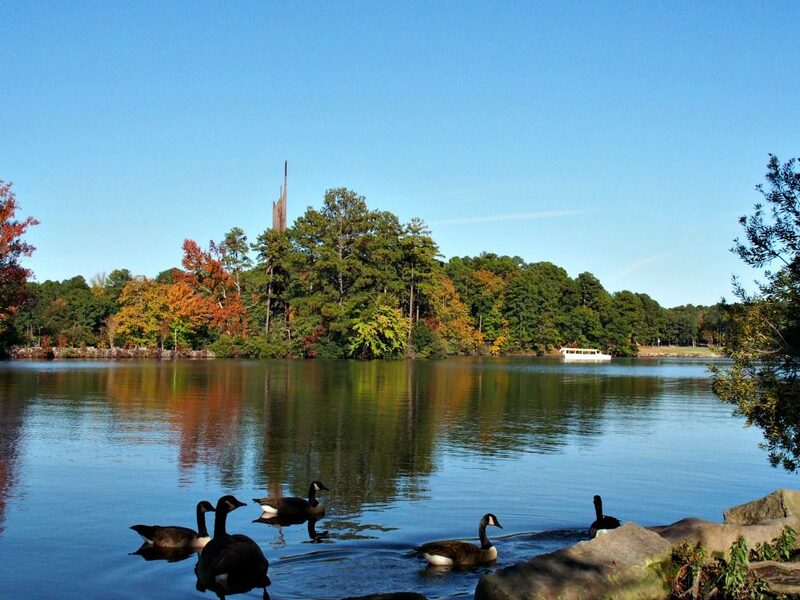 Park your RV- or even rent one- at Stone Mountain Campground. 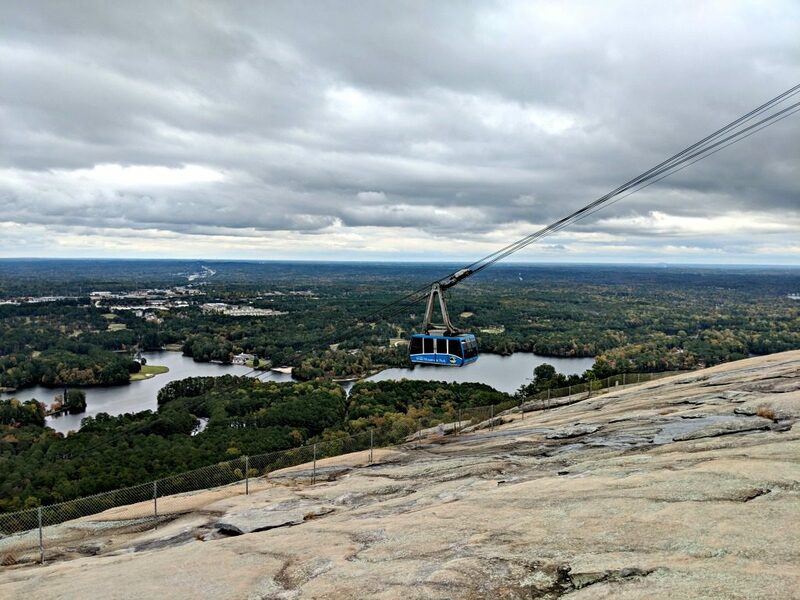 Located within Stone Mountain Park you will be perfectly placed for all the adventure the 3200 acres of parkland has to offer, as well as in easy access to the rest of the county’s attractions. Campsite sit at the edge of Stone Mountain Lake, though you will need to hike away a bit for this view of the carillon. It’s the Texas you imagine. A place where the western frontier meets the today and they mesh beautifully. A spot where cowboy boots aren’t a fashion statement, but a way of life. 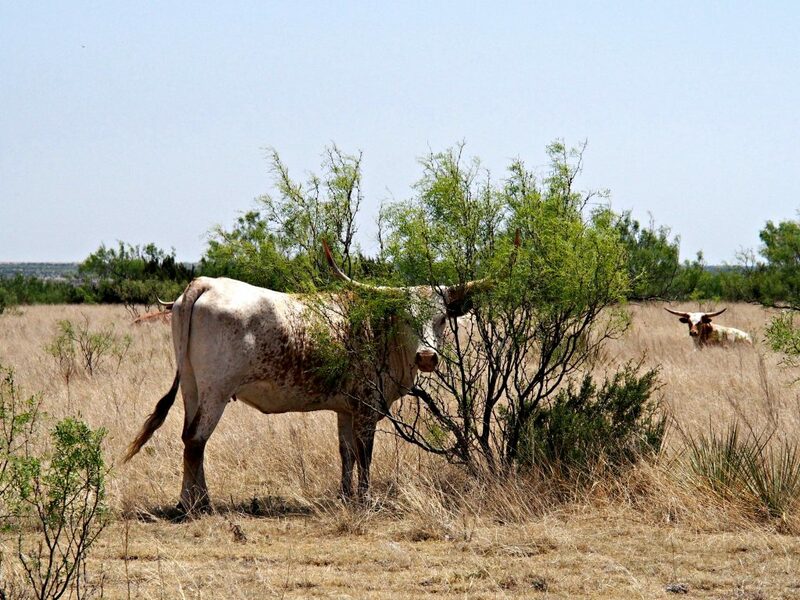 Texas longhorns graze above Palo Duro Canyon. Amarillo is a ‘modern day cow town’, where the southern plains meet the desert. A location made for exploration and adventure. Outdoor enthusiasts will be drawn to Palo Duro Canyon State Park. 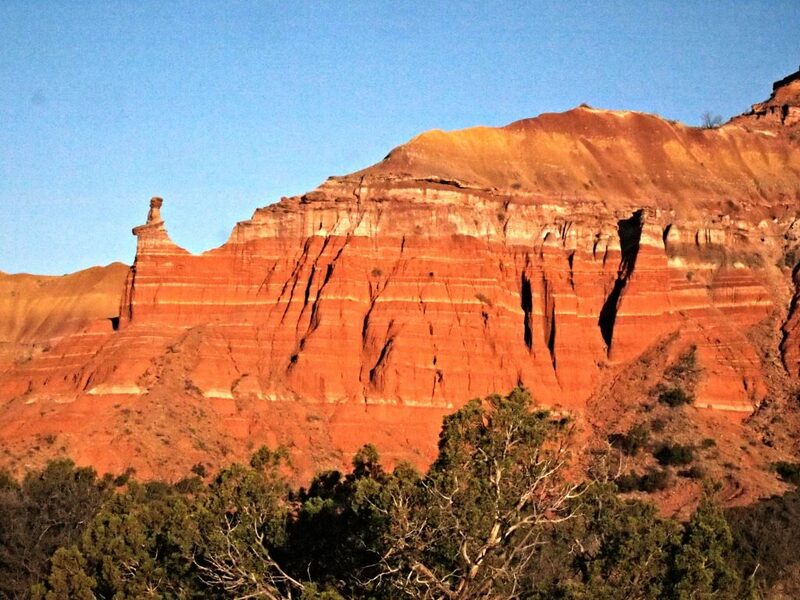 Just 30 minutes from downtown Amarillo, Palo Duro is the second largest canyon in the US. Within the canyon you can hike, bike, or go horseback riding. Or fly over the canyon on a zip line. Palo Duro Canyon is the second largest canyon in the US. Amarillo is the largest Texas city on Route 66 and home to the quirky Cadillac Ranch and the Route 66 historic District where you’ll find quirky galleries, antique shops, restaurants, and bars. Just west of the city is the famous Mid-Point Cafe, aptly named as it sits at the midpoint of the Mother Road. Tip: Take a piece of Cadillac Ranch home with you from Lile Art Gallery. Crocodile Lile creates jewelry from ‘Cadilite’, the layers of paint that chips off the cars. Within the city you’ll find wonderful museums dedicated to the history of the area. 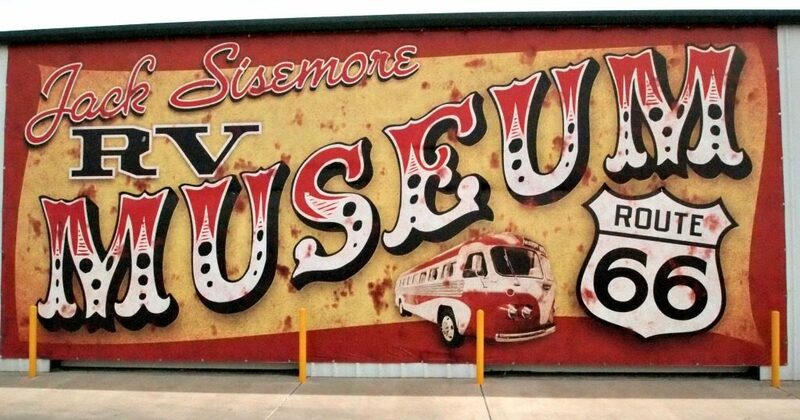 RVers won’t want to miss the RV Museum at Jack Sisemore’s Traveland. The history of RVing is laid out before you, from the Model T Lamsteed Kampkar to the first Itasca ever built, and the oldest Fleetwood in existence. You’ll also find a really great shop for all your RV needs (and wants). The history of RVing is laid out before you at Jack Sisemore’s RV Museum. The museum is free to visit. The Panhandle Plains Historical Museum guides you through prehistoric Texas and the native peoples to pioneers and petroleum. At the American Quarter Horse Museum you’ll learn about the first horse original to the US, why it was preferred by cowboys, and a timeline of cowboy history. When you’re ready to leave the RV for some Texas cooking you’ll find plenty of choice. The Big Texan Steak Ranch and Microbrewery is a Route 66 staple, known for it’s 72 oz steak challenge. But you’ll find everything from brewpubs and incredible TexMex to Texas Bar-B-Que and international eats. For a memorable meal make reservations for a Chuck Wagon Event on the rim of Palo Duro Canyon at Longhorn Ranch. Authentic chuck wagon food and history are interwoven at this dining event. Amazing photo opps included! Spring weather in the Texas panhandle is cold at night and warm during the day, with temperatures ranging from the mid 30s to the low 80s. If you’re planning to explore the canyon be sure to carry plenty of water as temperatures get higher at the base. 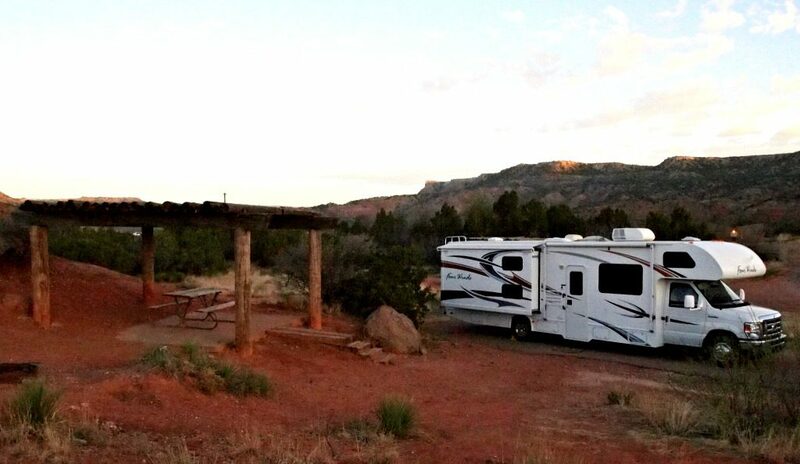 Though you’ll find plenty of camping options you really can’t pick a spot better than Palo Duro Canyon. There is nothing like camping in the canyon with the Spanish Skirts rising behind your RV. Disconnect and camp at Palo Duro Canyon State Park! The drive into the canyon is steep with switchbacks, so be sure to unhook your towed vehicle before descending! Rentals from the Amarillo airport are also quite affordable if you don’t wish to tow behind your motorhome. The ‘Las Vegas of the Midwest’ may be known for its bright lights and over-the-top shows, but you’ll find that Branson offers incredible outdoor adventure, amazing beauty, and mouthwatering foodie delights. 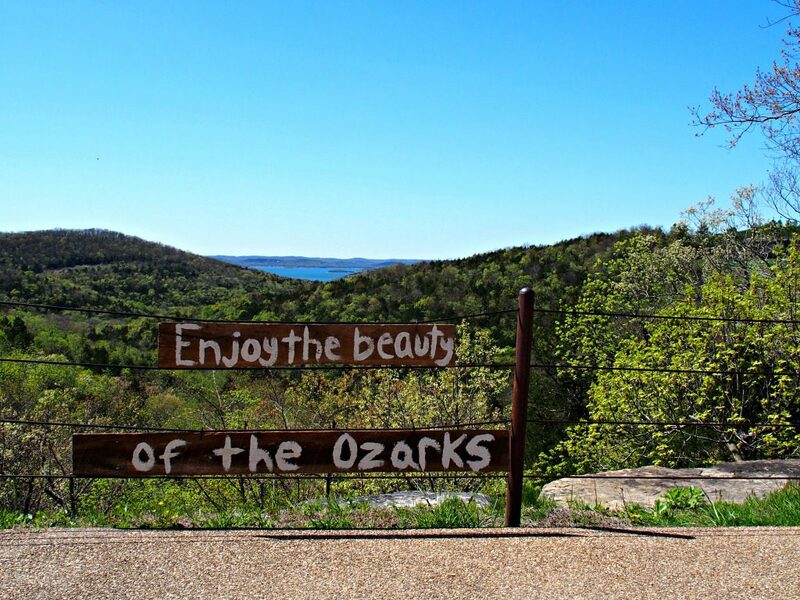 Enjoy the stunning beauty of the Ozarks in the spring. Your approach to Branson is an advertisement of all there is to see and do. 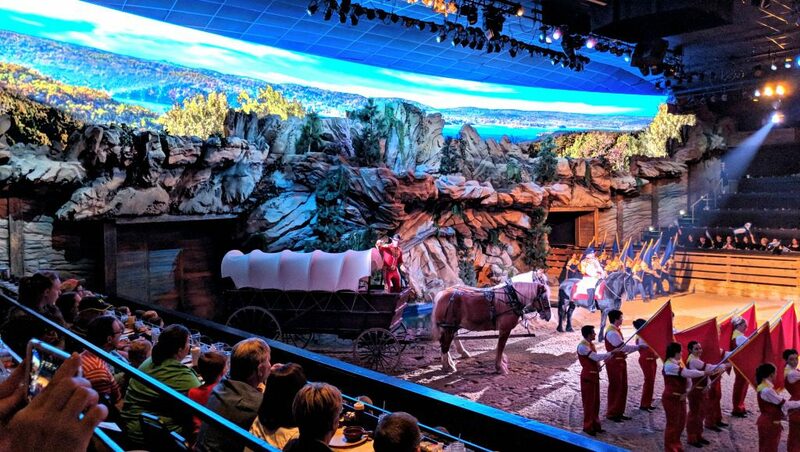 Live shows of all types, from family-friendly animal escapades and amazing acrobats to large stadium concerts and musical tributes, the stage shows in Branson are spectacular. You’ll find plenty of entertainment in Branson! Dolly Parton’s Stampede is one of the most popular shows in town. In the town of Branson you’ll find big, bold, and quirky. Dicks 5&10 was build on the idea that no other store would be as well stocked. You can find everything, yes everything, here. Bigfoot on the Strip offers heart pounding rides for teens and adults, along with a maze and arcade for all ages. Their Bigfoot Discovery Expedition is a tour you have to experience to believe. Branson Landing on the Lake Taneycomo lakefront, features a water attraction that brings together fountains, fire, lights, and music. Around that you’ll find shops, rides, and plenty of restaurants. Time Traveler, the world’s fastest, steepest, and tallest spinning roller coaster are just waiting for fearless riders. If you’re not that fearless, the park’s shows, culinary classes, and live artisan demonstrations are more than enough to keep you busy. And don’t forget about the cave beneath the park that started it all. Tip: If you are traveling with a Veteran be sure to arrive for the opening ceremony. It’s so moving to see your Veteran honored. Branson is an area made for outdoor adventure. Located in the beautiful Ozarks, it’s an area of water, hills, and valleys. It’s truly a location that will please everyone. Kayaking on Lake Taneycomo is a prefect adventure on a beautiful spring day. Thrill seekers can choose mountain coasters, zip lines, snowflex tubing, axe throwing, and ATV adventures. If you want something a little less hair-raising consider lake cruises, golf (mini or regular), hiking in Dogwood Canyon Nature Park, or a golf cart tour at Top of the Rock. You’ll find that food is plentiful, and plenty good, in Branson. Some of the best BBQ in the country can be found at Gettin’ Basted, while Danna’s Bar-B-Que & Burger Shop features a dinner roll that is so beautifully sweet it nearly melts in your mouth. Need a powerful good breakfast to start your day? The Center Stage Grille is the place to feast. Weather in southern Missouri is quite nice in the spring with temperatures ranging from the upper 30s to the mid 70s. Spring storms can be fierce, so do ask about safety procedures at the campground. There is no shortage of great camping in and around Branson. For a park with great amenities and a terrific location choose Silver Dollar City Campground. 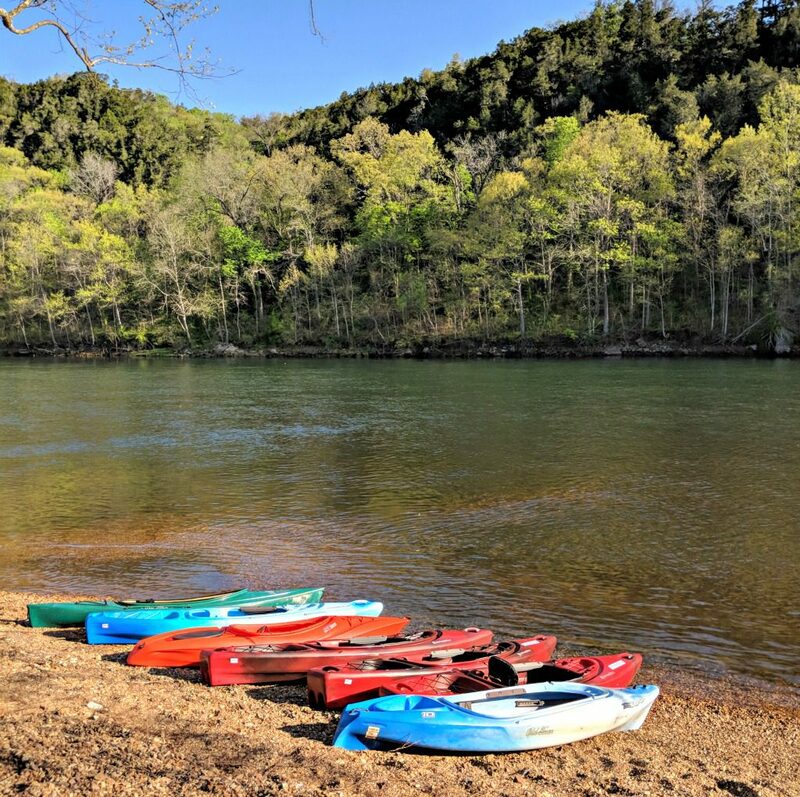 You’re only minutes from many outdoor activities and the complimentary shuttle to Silver Dollar City is a great benefit. 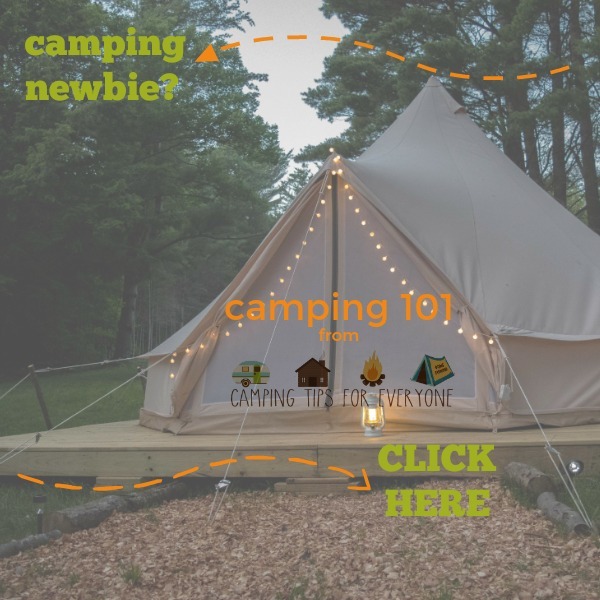 Considering a Multi-generational Camping Trip? Louisiana is the American home of Mardi Gras, and spring break will bring you into the area just after the big party. But that doesn’t mean Lake Charles will be a quiet place! 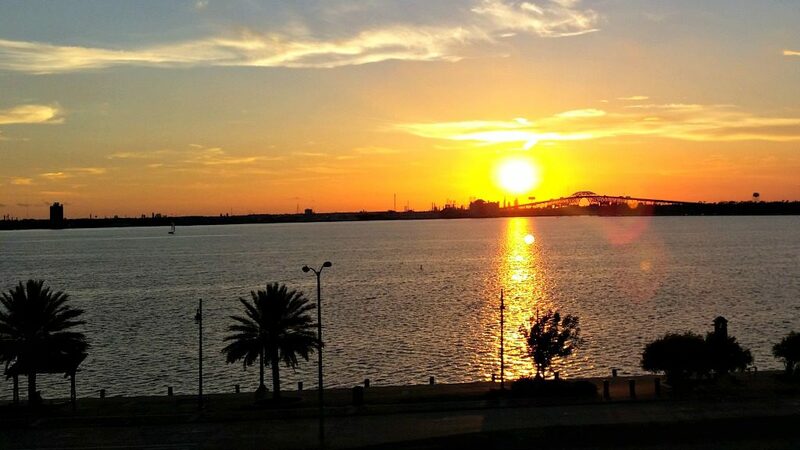 Lake Charles is where Cajun meets Creole, the thriving city slowly giving way to the more rural areas that end when they meet the Gulf of Mexico. Where the people are as warm as the breeze and the food is as exciting as the adventures you’ll find. If you’re seeking foodie adventures, Lake Charles is the destination you need to choose. Begin with the SW Louisiana Boudin Trail. Located along Interstate 10 you’ll find dozens of locations that serve this unique sausage. Pick a few spots to stop for taste testing as each butcher has his own recipe and each location offers different serving options. Some locations, like LeBleu’s Landing in Sulphur (who have the best Boudin Balls!) have a large window so you can see how the Boudin is made. And, bonus, you’ll also find kracklins at many of these spots! Then move on to traditional Cajun and Creole dishes. Gumbo, jambalaya, crawfish, Po-Boy sandwiches, and Étouffée can be found on menus across the parish. Along the way you might be able to determine the difference between Creole and Cajun foods. Love seafood? 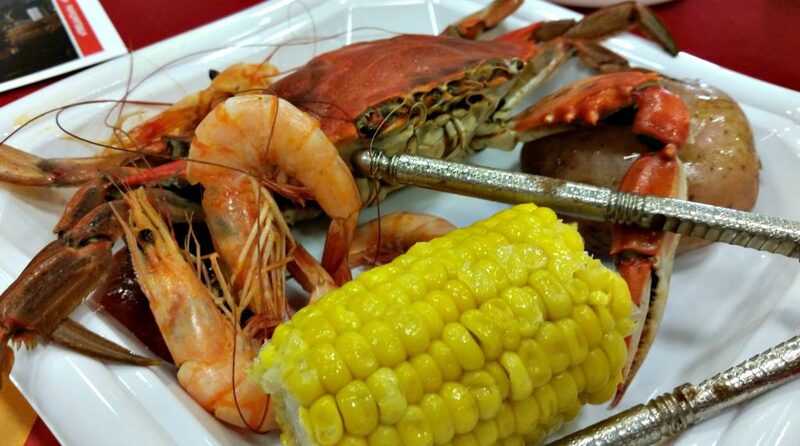 Lake Charles is the place to go for Louisiana seafood boil, crawdad, crab, and shrimp! For a sweet you truly can’t beat a fluffy beignet, served warm. And if you happen to find a King Cake in a bakery be sure to grab it! Now that you have your foodie bucket list created it’s time to get active! The Creole Nature Trail is a great place to begin. The 180 mile scenic byway has been described as ‘Louisiana’s Outback’, guiding you along beautiful beaches, through haunting bayou, and introducing you to local wildlife, from alligators to the many birds that migrate through the area. 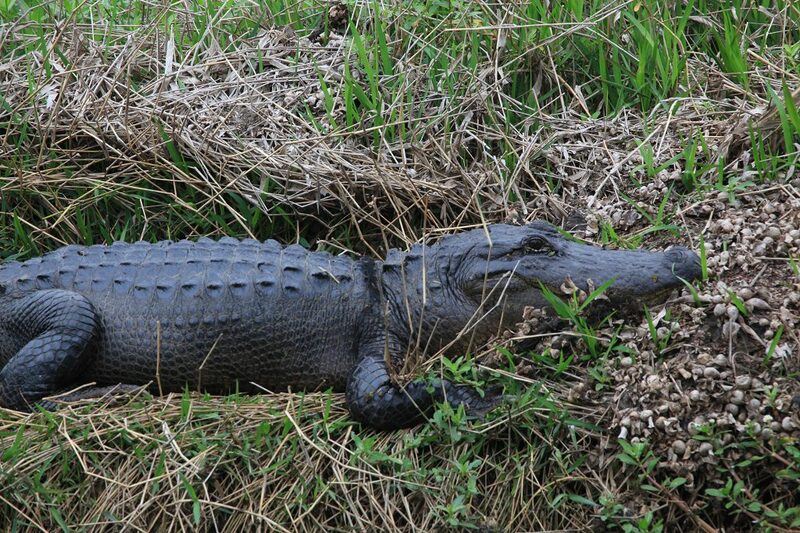 Explore the wildlife in Louisiana’s outback along the Creole Nature Trail. Begin your journey along the Creole Nature Trail at Adventure Point for a preview of the sights, sounds, and culture of Southwest Louisiana. Tip: For a personal guided experience, download the terrific app Creole Nature Trail app. Hop off the trail once in a while to take advantage of Eco-Tours, airboat rides, and the wonderful walkways, refuges, and sanctuaries. Be sure to bring a bag to hold the shells you pick up on the beaches! For a closer look at local culture and heritage step into a museum or explore one of the cultural districts. The Mardi Gras Museum is unlike anything you’ve seen before. And the small Brimstone Museum commemorates the development of sulfur mining practices. The sub-tropical climate of Southwest Louisiana makes spring a perfect time to visit. Temperatures range from the low 50s to the high 70s in March and April. A+ RV Park is conveniently located along the Creole Nature Trail. 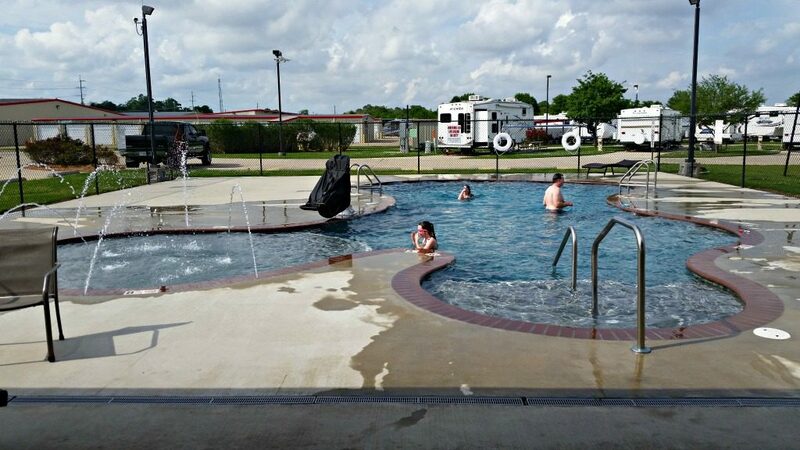 This clean & comfortable RV park has everything you need for a relaxing stay. A+ RV park along the Creole Nature Trail has all the amenities you need for a comfortable stay! If you like a ‘quirkier’ stay contact Lloyd’s Country Store where you’ll find 6 RV spots plus an antique shop and kayak rentals. If your spring break must involve a beach, escape to Gulf Shores. Enjoy relaxing on some of the most beautiful beaches in America, or get out on the sparkling water for fishing, diving, and boating. White sandy beaches and beautiful clear ocean waves. Gulf Shores is a perfect beach vacation for spring break. Begin at the beach! With 32 miles of white sand and plenty of activities to keep you busy, you can choose a different beach each day- depending on what you want to do! Gulf Place is the main public beach in Gulf Shores. This is the spot to visit if you want to spend the day relaxing on the sand with a drink in your hand. You’ll find beach attendants, open-air pavilions, restrooms, and showers on site. 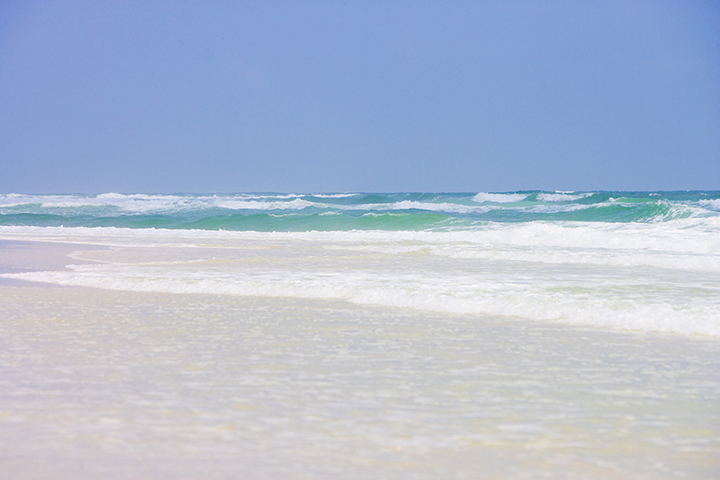 Gulf State Park offers 3 miles of beach as well as boating, paddle boarding, and fishing. The state park also features an 18 hole golf course, paved trails, and a nature center. Tip: You can rent everything you need for the beach- from chairs and umbrellas to paddle boards and kayaks. When you’re ready to get onto the water you’ll find plenty of activities waiting. Head underwater to snorkel or dive, float on the water with boating and fishing outings, or even go parasailing above the waves. 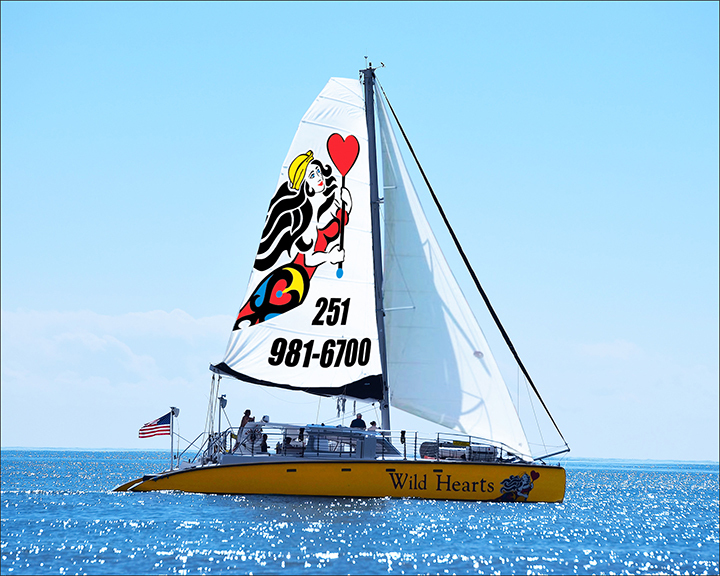 Sunset cruises or Dolphin & Angel cruises can be booked aboard Wild Hearts catamaran. 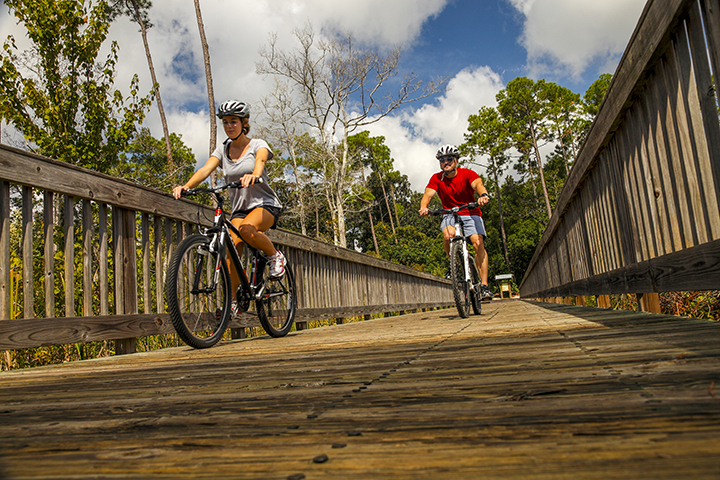 For outdoor activities that don’t involve the beach move inland for biking, hiking, and ziplining. Gulf Shores has seven food trails– one for each day of the week. Seafood, gumbo, burgers, and desserts. You definitely won’t go hungry! Start summering in the spring in Gulf Shores. Temperatures range from the mid 50s to the mid 70s in march and April. Just 1.5 miles from the white sand beaches, Gulf State Park Campground has 496 full hookup campsites with paved pads. You’ll also find a swimming pool, weekly activities, and trail access for hiking and cycling. Beautiful campsites at Gulf State Park Campground. Which of these RV vacations for spring break will you choose this year? Great suggestions! Sadly I haven’t been to any of these places. I’ll need to change that!